As I mentioned in a previous post I recently made dinner for my mother-in-law’s birthday party, and this bisque was how we started the meal. Of everything I made that night (all of which was delicious of course! ), I have to say that this was probably the best dish of the bunch, and was a huge crowd pleaser. Carrots and ginger are such a classic combination of flavors, and the addition of the slightly sweet basil honey crème really put it over the top. I do apologize for the photo… I was in the middle of plating for 15 hungry people and didn’t really have time to snap a good pic. Oops! Serves 8-12 as an appetizer. In a large pot (I used an 8qt) heat your olive oil on high, then add the carrots and 1tsp each of salt and sugar. Cook until the carrots are lightly browned, then add the white wine and simmer on high until it has reduced by half. Add the vegetable stock, water, cream, 2tsp salt, black pepper, nutmeg, grated ginger and honey. Bring to a boil then reduce the heat to medium-high and simmer uncovered for 1 hour, stirring periodically. Puree using a hand emulsifier, or by doing separate batches in a food processor or blender, until you have a smooth bisque. Reduce the heat to medium-low and simmer uncovered for an additional 25 minutes. During the final simmer it’s time to make the crème. Pulse the basil in a food processor until finely chopped, 20-30 seconds. Add the sour cream and honey, then mix until fully blended and smooth. Keep the crème in the refrigerator until you’re ready to serve. Once the soup is done simmering it’s time to serve it up! Ladle it into some bowls, drizzle it with the crème, and enjoy… If you want to turn it into an entrée then serve it with some seared shrimp or scallops, or maybe some gnocchi that’s been sautéed in brown butter, or all of the above! Now let’s talk wine pairings… You could go in a number of directions here. A dry sparkler or Rose, or possibly a drier style of Riesling or Gewurztraminer. I would stay away from anything too grassy, acidic or mineral driven, or anything too big, buttery and oaky. If you don’t do whites or pinks and have to do a red just make sure you keep it light, like Gamay, Frappato, Mayolet, a lighter bodied Pinot Noir, etc. DO NOT have this with a full bodied red, all of the subtle flavors of the bisque will be lost. Below are a few recommendations that I think would be ideal. So there you have it, my bisque recipe and a few recommended pairings. I hope you’ve enjoyed the read and will give the recipe and wines a try. As always, more new content is en route, in the meantime crack open a bottle of something special, sit back, and relax. Life is short, enjoy it! 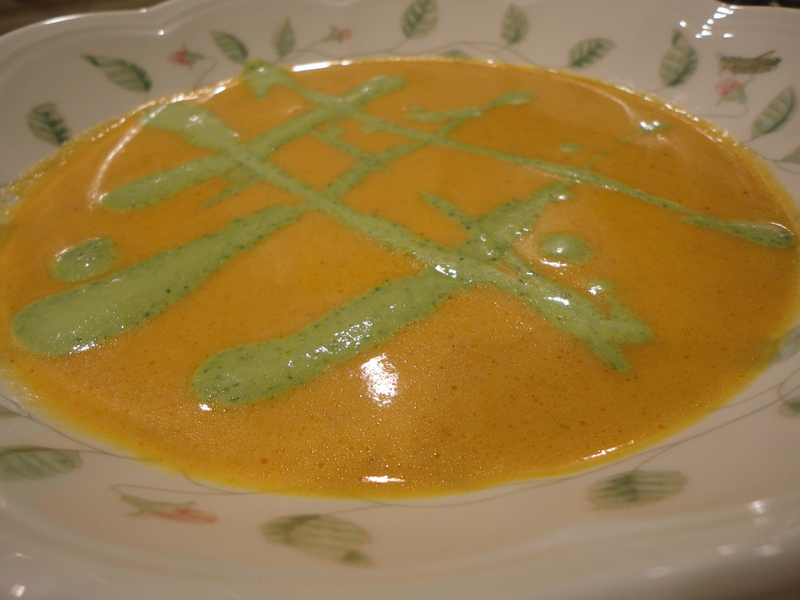 Tags: bisque, carrot, cooking, food, ginger, gluten free, perfect pairings, perfect pairings at home, soup, vegetarian. Bookmark the permalink.